I’ve always loved to write. As early as my 3rd grade year, I knew I wanted to be ‘a writer’. While I didn’t have the courage to pursue writing as a career for many (many, many) years, putting words down on paper or computer screen always allowed me to express my thoughts, feelings, emotions. That’s why when my dearest friend died, I turned to writing to journal the grief I felt. That grief was devastating at first. For a long time, actually. But as I wrote through my journey, praying and learning to know God along the way, I made it through…in a way I’d like to think has made me stronger. More faithful. Loving. Not everyone likes to write, though. And as I thanked God for giving me a means to journal through my grief, I wondered how those who don’t share my love for the written word might find a way to express their own. I looked back over some of the things I did in addition to writing and thought they might help you, too. 1. Use quotes – throughout social media, in the newspaper, in a book, or a website find encouraging, motivating, or any quotes that resonate with you and write them down. You don’t have to use original words to express your emotions. Let quotes from others express your feelings for you. Writing them in a notebook will allow you to express that emotion as you write, and you’ll be able to look back over those quotes in times to come. 2. Use pictures – Look through magazines, cut out pictures that ‘speak’ to you. The images could be of an activity you shared with your loved one or possibly express an emotion you’ve felt or are feeling. Start a file folder to keep them in, and paste them in a notebook. You’ll be able to look back through them when you need time for meditation, reflection, and when you want to look through your journey and progress. 3. Share a specific memory of a time together. Make photocopies of any pictures you have of that day (so you don’t have to paste the original unless you want to). Add any mementos like ticket stubs, cards, etc. Caption each item with a thought or feeling it evokes. 4. Make lists. If you don’t like to write, the thought of paragraphs can overwhelm. Instead, make lists. You can list 5 favorite memories or 10 things you loved about they way looked or things they said to you. You have unlimited possibilities on what lists to make. They’re quick to jot down and allow you a chance to brainstorm, remember, and express. One of the most beneficial lists I made was a list of the things I was afraid to face without my loved one. At the time I made it, I cried the whole way through. Later, I’ve been able to look back and work on ways to face those fears. 5. Use color. Grab crayons, colored markers , or paints and some paper. Without any words or pictures, use only colors to express your emotions. Mix them, swirl them, keep them all in even lines…however you apply them and whatever colors you use are perfectly okay. Allow your feelings to come out through color. 6. Write song lyrics. So many songs touch my soul. When you hear a verse that resonates with you, write it down. Use a note taking app on your phone if needed to jot them down on the go and then add them to your notebook later. It’s soothing to look back through the lyrics you’ve collected over time. 7. Record an audio journal. My phone has a simple voice recording app. You could also use an app, a digital voice recorder , or you could even use a regular old-fashioned cassette recorder if needed. Rather than write down your thoughts, emotions, and memories, talk about them. Sometimes there are things we want to say, but we don’t want anyone else to hear. Keeping an audio journal allows you to say anything you need. There are no right or wrongs ways to journal your way through grief. You don’t have to hold back or keep your grief inside just because you don’t like or want to write. It’s your journey and your journal. Please share in the comments below ways you’ve journaled without writing. Want to remember this? 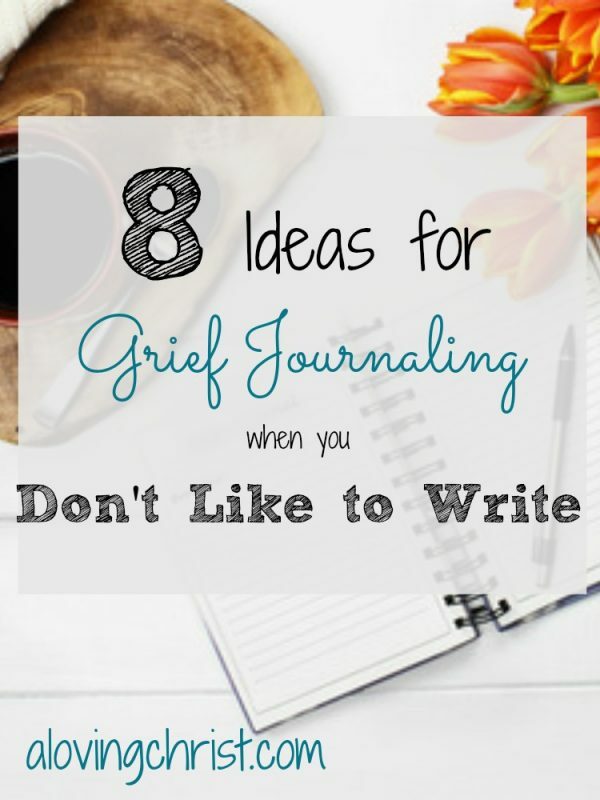 Post Grief Journaling When You Don’t Like to Write to your favorite Pinterest board! My sister bought us both journals after our mother passed(month ago) and I did note know how to start. You have gave great suggestions that I think will help me along. I’m so sorry about the loss of your dear mother. I’m thankful these ideas will help! Journaling is a wonderful way to express all of the many emotions grief brings. I will be praying for you! Hi Julie, what a useful guide for so many of us. Sadly, we will all face these difficult times at some point in our lives and your tips will surely help make this time maybe a tad more constructive. Love all your ideas for writing creatively! Sorry, you lost your friend when you were young. But, it looks like you found your passion. This was a great post! Sometimes we just need to remember that journaling doesn’t have to mean only writing, it is a way to get our feelings out in different ways whether it is using song lyrics, quotes, or pictures like you suggested. What wonderful thoughts on getting through a difficult time. I too tend to write it out when there is something I need to work through. At one time, I was having a really difficult time after an accident and a dear friend really encouraged me that I needed to write a book about it all. I don’t know that I actually did need to make this one into a book, but the whole process really helped me to deal with the physical and emotional issues in the aftermath of what really was a life changing accident. You’re exactly right that it’s the process of it all that helps so much! Sorry for your loss! 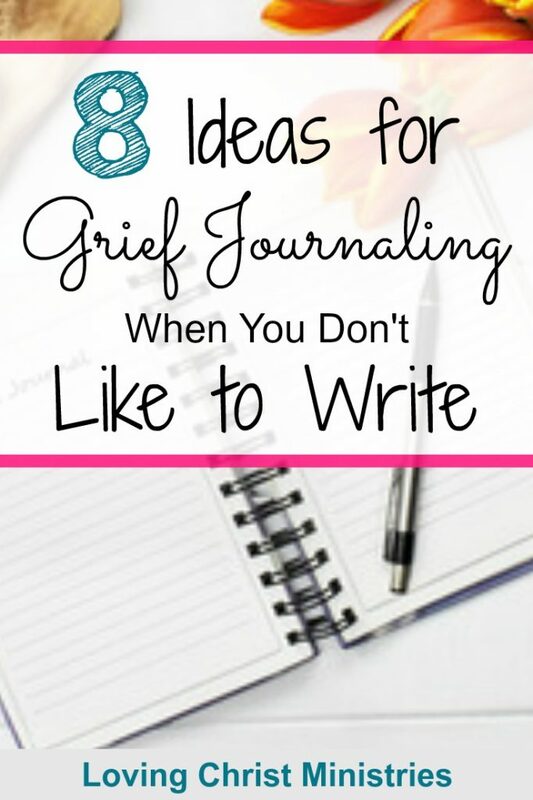 Thank you for sharing your tips for grief journaling. You shared some great tips and ideas for people to use. My daughter writes in a journal all the time it’s how she handles her grief of losing her step-mom and grandpa to cancer. I’ll show her your posts I think she would like your tips especially the song lyric idea! Thank you again for sharing!